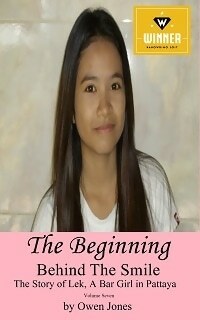 I have not been getting on well with Lek6, the sixth volume in the series ‘Behind The Smile ~ The Story of Lek, A Bar Girl in Pattaya‘ or at least not in comparison with the others. I have written 16,000 words which amounts to about fifteen percent of the 112,000 words I want the book to eventually be in length. I have also more or less decided on the title, Full Circle, which ties in with a lot of what I have written already and the ideas I have for future chapters. I am not going to give anyting away about the storyline of Full Circle at this stage, which is chapter four, but I will try to think of something that won’t spoil anyone’s enjoyment of the full book after chapter five, or possibly ten. I can tell you this though, it will be a miracle if I can get the same artist to do a matching cover. I have been emailing her but she is not replying. It is very worrying. Another thing that I can reveal is that my daughter, the cover girl, would like the sixth volume to be pink. If anyone has any useful suggestions for a cover designer for Full Circle, please let me know as soon as possible, because I like to get the cover out of the way before I finish the story. On a different topic, if you have been following the exploits of our garden visitor, the Clouded Monitor, I have an update. Lizzie was spotted roaming the village yesterday, but no-one has seen her today, which is probably a bad sign. However, Angun, our dog was going potty this afternoon, pointing at a bush. I had a look, but couldn’t see anything. A few minutes later, she ran into the bush and I saw something about two foot long flash through the fallen leaves. I think it was a snake, but my wife thought that it was Lizzie’s tail.